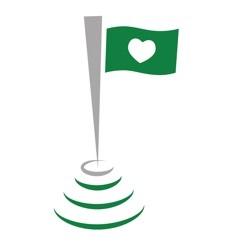 A HOLE MATTERS Fundraising with Golf GPS the only free golf app that lets golfers pledge a dollar amount to a charity (501 (c)(3) nonprofits) or individual fundraiser based on their scores on all, any or a hole they play. The free golf GPS app features all the tools a golfer needs to play better including accurate yardages from tee to green, real-time wind speed and direction, golf course mapping to hazards, bunkers, etc. with a touch of the screen. 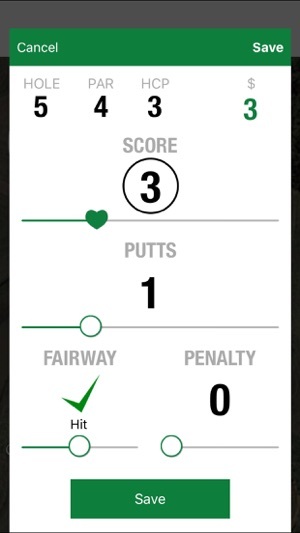 The app keeps a record of a golfer's stats such as fairways hit and putts made. With A HOLE MATTERS Fundraising with Golf GPS, golfers can host a fundraising tournament by inviting other golfers to play for a charity or individual fundraiser they support. 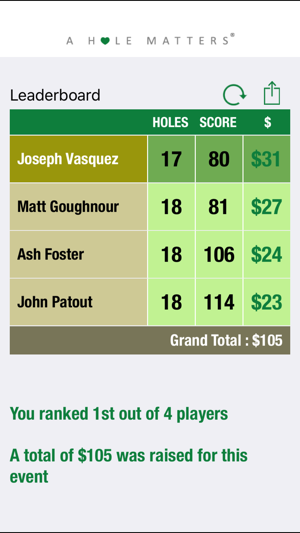 A HOLE MATTERS Live Leaderboard lets participating players to see their hole-by-hole scores in real time similar to PGA Tour or LPGA golf tournaments on TV. A HOLE MATTERS Fundraising with Golf GPS calculates the total at the end of the round and let golfers donate directly to the individual or charity they are playing for. A HOLE MATTERS uses WePay as a payment processing partner, which is used by popular crowdfunding platforms including GoFundMe, Crowdrise, YouCaring, Fundly, among many other crowdfunding platforms. You do not have to be a golfer to use A HOLE MATTERS. Any nonprofit and individual can create a fundraiser on A HOLE MATTERS by visiting https://aholematters.com. Nonprofits/Charities need to claim their charity page at https://aholematters.com/non-profit. Once their page is claimed and verified, nonprofits can create as many fundraisers as they want and invite golfers that support their charity to donate to their fundraiser every time they play golf. Individuals can donate directly to the charity's fundraiser if they do not play golf. The website is open for all to use. Only A HOLE MATTERS Fundraising with Golf GPS is for golfers. 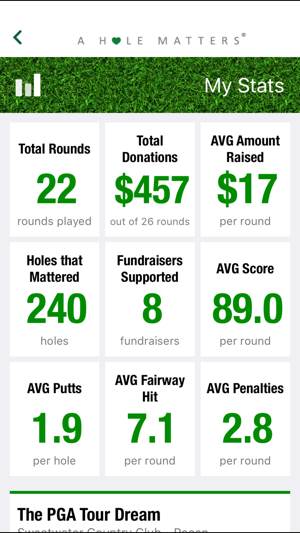 A HOLE MATTERS Fundraising with Golf GPS app is free for golfers. 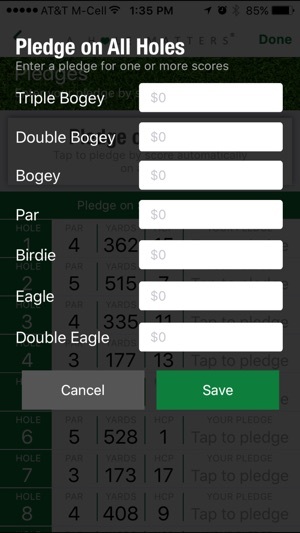 After four rounds of using the app without making a donation, golfers are required to make a minimum donation of $5 to a personal or charity fundraiser that they had selected. 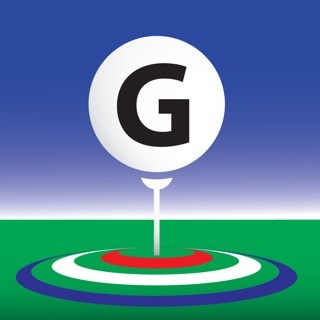 A HOLE MATTERS Fundraising with Golf GPS is a fundraising app integrated with features found in other golf GPS and rangefinder apps like Swing-by-Swing, GolfLogix, GolfShot, SkyCaddie, and GolfPad. 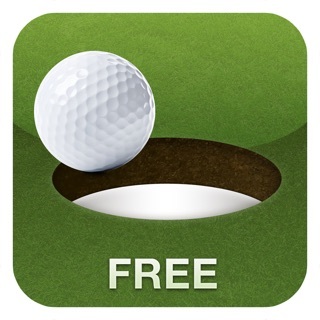 Great app for golfers. It has all the features to play better golf. Very accurate yardages. It even includes wind speed and direction. Golfers can pledge a dollar amount on all, any or a hole they play. They can even have a tournament with the live leaderboard. Charities would benefit from this if they invite their supporters who play golf to use app and designate donations to them every time they play a round. It’s like GoFundMe for golfers. Just finished my first fundraiser through AHM. The experience was very simple! It took a couple holes to get used to the formatting, but it didn't take long. 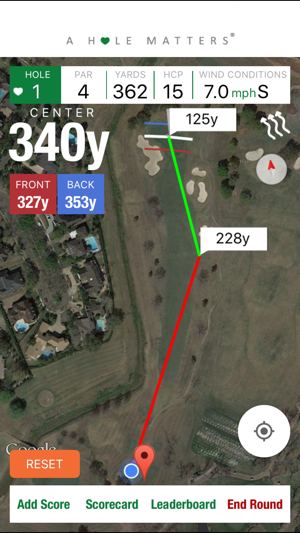 I felt it was a pleasant surprise finding that the app has a gps tracker for golf courses that seemed pretty accurate. We were able to raise money for a great cause, and definitely will be something I will continue using. Has all the tools I need when playing. Playing for a cause makes it even more worthwhile.